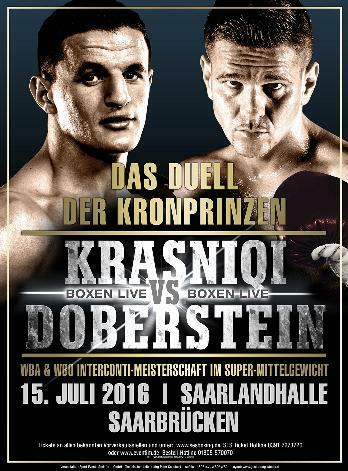 Doberstein Promotions and SES co-promote an event at the Saarland Halle in Saarbruecken (Germany) July 15. Topping the bill is Juergen Doberstein (20-2-1) defending the WBA Intercontinental supermiddle title against two-time lightheavy contender Robin Krasniqi (45-4). At stake is also the vacant WBO I/C title. Doberstein is ranked # 11 by the WBA and # 15 by the WBO while Krasniqi is ranked # 5 by the WBO. The Orial Kolaj (17-5) vs Kevin Thomas Cojean (19-7-1) fight for the vacant EU lightheavy title set for July 1 in Rome is off. Cojean suffered a hand injury in training and will be out for at least two months. Promoter Davide Buccioni have cancelled the promotion. Samir Ziani (22-2-1) and Guillaume Frenois (41-1) clash for the vacant EBU superfeatherweight title November 5 in Levallois Perret on a MK Event promotion. It´s an all French matchup and Frenois have been waiting for some time as he was official challenger for Juli Giner, who then relinquished the title.